Teamsters at more than 100 plants in the U.S. and students at more than 70 campuses across the country held shop-floor actions and wore stickers in a national action April 2 to demand that the company stop abusing workers and the environment. 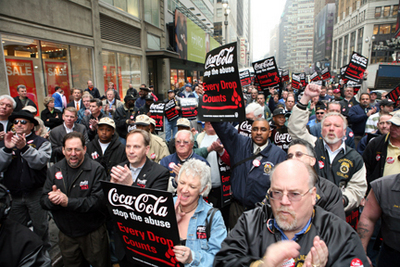 Coke recently paid $192 million to settle an employee lawsuit over widespread racial discrimination and is attempting now to cut jobs and health and retirement benefits. Overseas, the company has been found guilty of contaminating water and farmland in India and has allowed death squads in Colombia to murder eight pro-union employees at a bottling plant. Two thousand representatives of the country’s largest builders’ union gathered in Washington, D.C., March 28 and heard the Democratic presidential candidates pledge their support for labor and promise to get the United States out of Iraq. The trade unionists shouted down a Republican leader who backed the war. “This war is a mess. We should bring the troops home now!” shouted Rep. Dennis Kucinich (D-Ohio), bringing the crowd to its feet with thunderous applause. When House Minority Leader John Boehner of Ohio, one of two Republicans who spoke, said, “If we don’t fight them in Iraq, we will be fighting them here in America,” he was booed loudly. Sen. Hillary Clinton (D-N.Y.) received several standing ovations for her comments in favor of raising the minimum wage and protecting the rights of workers to organize. Sen. Barack Obama (D-Ill.) told the crowd that he had been against the Iraq war when it came before Congress in 2002. “I stood up and said this is a bad idea,” Obama said. The Respect Act, introduced into Congress March 22 by Rep. Robert Andrews (D-N.J.) and Don Young (R-Alaska), would reverse National Labor Relations Board rulings that classify millions of workers as “supervisors” and therefore ineligible to bargain for better wages and benefits. On Tuesday, May 1, in honor of International Workers Day, longshore workers will stop work in the West Coast ports of Oakland, San Francisco, Richmond, Benicia and Redwood City, Calif., and of Seattle. The workers involved are the ones who do all the loading and unloading of containers and other cargo while ships are in port. The action is in solidarity with national May Day actions for immigrant and worker rights. Resolutions passed by the International Longshore Workers Union Local 10 in San Francisco and by ILWU Local 19 in Seattle call for longshore workers to hold a “stop work meeting” on May Day and “participate in the Great American Boycott II, in support of workers’ and immigrant rights on that day.” The National May 1st Movement for Worker and Immigrant Rights has called for mass demonstrations and stay-aways in cities across the country on May Day. This Week in Labor is compiled by John Wojcik (thewritergdr @ europe.com).